Provide the dependency with a title. Click here for more information about defining titles. 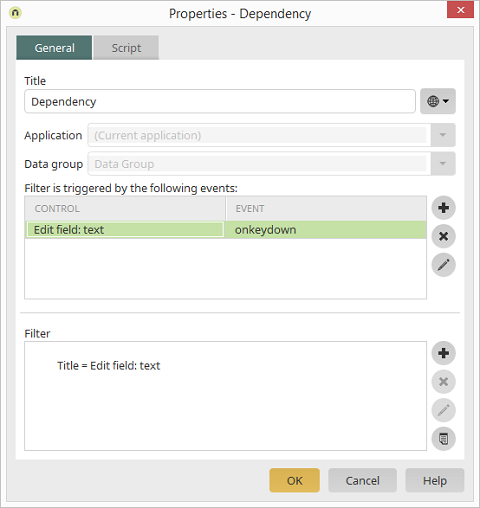 If this dialog was opened from the properties of an application page, the application and data group can be selected here that the dependency should be configured for. Opens a dialog where an event and control can be selected. Deletes an event from the list. Opens a dialog where a different event can be assigned to the selected control. The filter is defined here that should be applied to the dependent data group. Opens a dialog where a filter expression can be formulated. A complete description of dependencies can be found here.